It's pretty cool that, on the 200th anniversary of her birth, there have been three books (fiction, graphic novel and narrative non-fiction) published featuring Ada Lovelace. Ada Byron Lovelace is the person considered by many to be the inventor of computer programming and also the daughter of notorious romantic poet Lord Byron. She's also a wonderful role model in this age of GlodieBlox, STEM and Rosie Revere, Engineer. 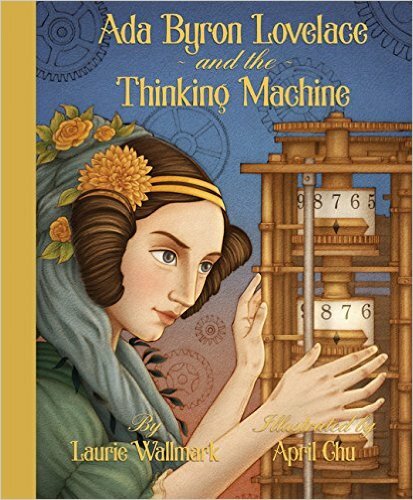 Happily, Ada Byron Lovelace and the Thinking Machine by Laurie Wallmark and illustrated by April Chu, the third book featuring Ada Lovelace to be published this year, is a biographical picture book that is accessible to readers of all ages. Chu's illustrations are filled with life and movement (and Ada's loyal cat by her side for most of the book) and call to mind the work of Brian Selznick. 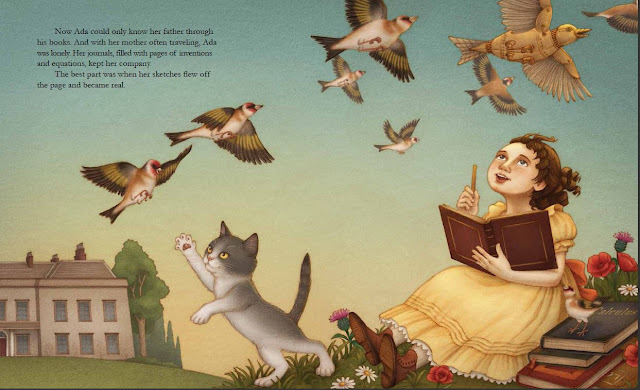 Add to this the fact that Ada Byron Lovelace and the Thinking Machine is published by Creston Books, a relatively new publisher dedicated to putting out a broad range of quality picture books - that are printed in the United States - and you have an absolutely gorgeous book in your hands! It seems perfectly fitting that a picture book biography of Ada Byron Lovelace be written by a teacher of computer science and illustrated by an architect. Wallmark focuses on aspects of Lovelace's life in a way that will appeal to young readers, beginning with the fact that, while her father was a famous writer, and "Ada was born into a world of poetry," it was "numbers, not words, that captured her imagination." She goes on to share that Ada's mother, who had a passion for geometry, was called the "Princess of Parallelograms." As a child, Ada was fascinated by birds and flight and, through a series of equations and observations, she builds a set of real wings. Wallmark goes on to write of the case of measles that temporarily blinded and paralyzed Ada. Her full recovery took three years, but her mother was always at her bedside, keeping her mind sharp with mathematical problems. When Ada was ready, her mother hired Mary Fairfax Sommerville, the well known scientist and mathematician who, as Wallmark writes, "was living proof that girls could do math and do it well." It's hard to imagine a time in recent history when this needed to be proved and yet, 200 years later, there is still such a noticeable dearth of women in the sciences that newspaper articles are written about it, organizations and scholarships are created to reverse this and special "girl versions" of engineering toys are created to address this. Through Sommerville, Ada makes new connections in the world of mathematics and science, including Charles Babbage, the man who originated the concept of the programmable computer. 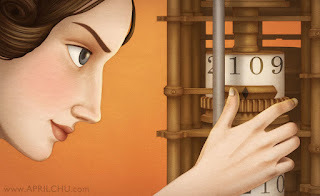 It was Ada Lovelace who, after poring over Babbage's thirty lab books filled with notes about his Analytical Engine, discovered that, without mathematical instructions, the machine would be a "useless pile of metal parts." Babbage never finished his Analytical Machine, so Lovelace never got to see her program run. But, as the final page of Ada Byron Lovelace and the Thinking Machine tells us, more than "one hundred years beofre the invention of the modern computer, Ada had glimpsed the future and created a new profession - computer programming." What's more, Ada was not lost to the pages of history. There is a computer language named after her and it is used, most appropriately, to guide modern flying machines. 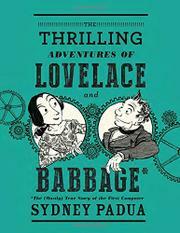 I hope that Wallmark and Chu have another book about Lovelace in the works, one that will delve a bit deeper into the Analytical Machine itself, and possibly more about what Lovelace's adult life was like living as a lady mathematician in London in the 1850s.